Will Jones sells water to shoppers at 7-Eleven in West Campus after the City of Austin issued a citywide boil-water notice due to high levels of debris, silt and mud in the water supply. A man reaches for a water bottle in a mostly empty bottled water aisle at Whole Foods on Sixth Street and Lamar Boulevard. This is the first time Austin Water has ever issued a citywide water-boil notice. A boil water notice remains in effect for Austin Water customers, and the city of Austin is pleading for people to slash their water consumption by 15 to 20 percent. Outdoor water use is being banned as part of what officials describe as an emergency situation. Travis County’s emergency management chief said the situation could last up to two weeks. Austin Water advises customers to boil water for three minutes before consuming it and says that water-filtration systems alone will not remove harmful bacteria. The utility says there have been no positive tests for "bacterial infiltration" of the water system so far, but emphasizes that there is still a risk. With all the silt and debris, the water treatment facilities are only able to produce 105 million gallons of clean water a day. Current water usage in Austin is at about 120 million gallons a day, according to Austin Water. "To provide necessary water pressure for fire protection, plants must distribute water at treatment levels not typical of the utility’s high standards for consumption," the public utility said in a press release. Austin Water says it's OK to use water for showering, laundry and washing hands but advises boiling water for drinking, cooking and making ice. Dishes should be washed in hot, soapy water and rinsed with boiled water. Bottled or boiled water should be used for baby formula and given to pets. This is the first time a citywide boil-water notice has been issued in the history of the water utility. "This isn't a conclusion we came to lightly," Austin City Manager Spencer Cronk said. "Unfortunately, this is simply a case of Mother Nature throwing more at the system than the system can currently process." The Austin Independent School District and UT Austin say they've taken steps to make sure any food served meets requirements of the notice. AISD also canceled all Monday night athletic events. The district's schools have started buying bottled water for students, and the Travis County Sheriff's Office has done the same for inmates in its facilities. 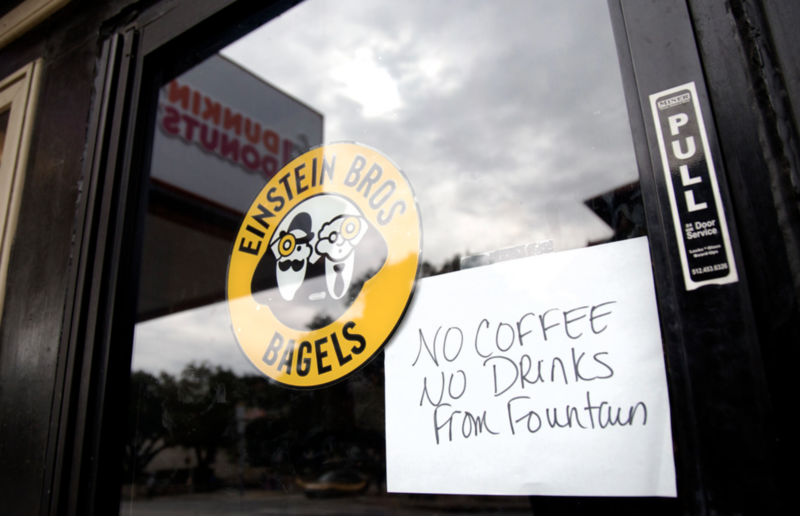 Einstein Bros Bagels was among the businesses forced to reduce their offerings because of the boil water notice. Some restaurants closed for the day because of water concerns, while others remained open, saying they're using water that's been boiled. "Coffee, you need water. Tea, you need water. Ice maker, you need water. Bakery, you need water. Personal hygiene, you need water," said Robert Maciel, whose wife Rose Maciel owns Joe's Cafe on East 7th St. He was delivering supplies to the restaurant, which plans to stay closed Tuesday. "It’s a loss of revenue but what can you do?” Maciel said. Bottled water has sold out at grocery stores across the city. H-E-B said it was sending 100 tractor trailers filled with water to restock stores. 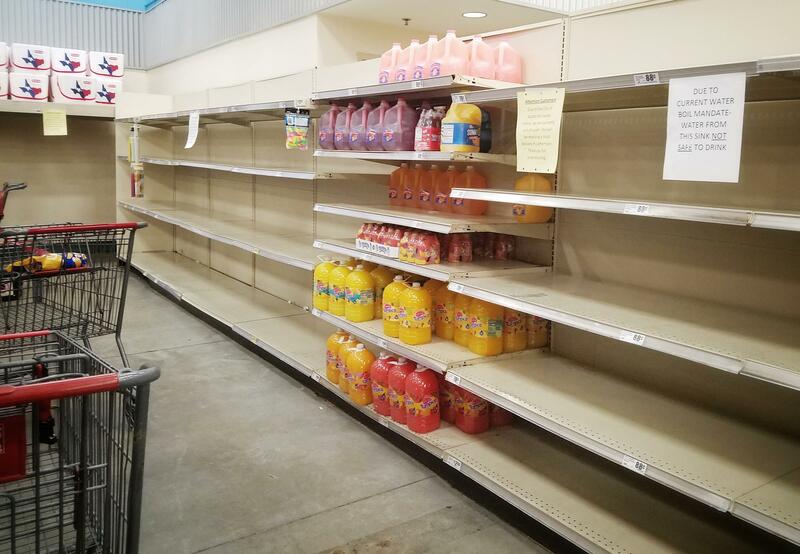 “I should have left a long time ago, but you know I got kids, so I’m just trying to wait," Victor Garza said while standing next to an empty shelf inside the H-E-B on East 7th St. He said he had been waiting for two hours after the store's general manager told him a new shipment was coming. Water shelves were empty this morning at the HEB at Pleasant Valley and Seventh. Austin Water will lift the boil-water notice once it's able to stabilize the treatment systems. "I don't know when it will end, we'll just have to take this day by day and hour by hour to see how our plants perform," Meszaros said. The city is working with the state's emergency operations center to see if it can ship in water normally reserved for disaster relief situations. Officials are also reaching out to surrounding cities to purchase more commercial water, while retailers like HEB and Walmart are diverting statewide shipments of water into the city. In addition, tanker trucks filled with water are making their way from San Antonio and other areas. To ensure destruction of all harmful bacteria and other microbes, water for drinking, cooking and for making ice should be boiled and cooled prior to consumption. The water should be brought to a vigorous, rolling boil for two minutes. You may also use bottled water. State laws require that a Boil Water Notice be issued if a water system has (or could have) become contaminated from water main breaks, loss of system pressure, or results of routine sampling in the system. What should I do if a boil-water notice is issued? Do not drink the water without boiling it first. Bring all water to a rolling boil for at least three minutes, and let it cool before using, or use bottled water. Boiled or bottled water should be used for drinking, making ice, brushing teeth, washing dishes, food preparation, and water for pets. Boiling kills harmful bacteria and other organisms in the water that may cause illness. You should throw away ice made during the time the notice was issued (freezing does not kill bacteria). Is the water safe for washing dishes, laundry and bathing? The water is safe for washing dishes, but you should use hot, soapy water and rinse dishes in boiled water. There are no restrictions on doing laundry. The water is also safe for bathing. How do I prepare food and baby formula? Only use boiled or bottled water for cooking, making ice, washing fruits and vegetables, and making baby formula. If you must use water to make formula, use bottled water. If you don't have bottled water, use water that has been rapidly boiled for at least three minutes. How long will the need to boil water continue? Customers should not stop boiling the water until they receive notice from Austin Water. Typically the need to boil water lasts for 24 to 48 hours, but can be longer. How long will depend on the conditions that caused the need to boil, how quickly the conditions are corrected, and how long it takes for laboratory results to confirm it is safe to return to normal water use. Austin Water will provide updates on the progress of corrective actions and how long the event is expected to last. What do I need to do when the notice has been lifted? Austin Water will notify you when it is no longer necessary to boil the water. You should flush your water system by running all cold water faucets in your home for at least one minute, cleaning automatic ice makers by making and discarding three batches of ice, and running water softeners through a regeneration cycle. Why is the boil-water notice important? Inadequately treated water may contain harmful bacteria, viruses, and parasites which can cause symptoms such as diarrhea, cramps, nausea, headaches, or other symptoms. They may pose a special health risk for infants, young children, some of the elderly and people with severely compromised immune systems. Austin Water officials are issuing an "urgent call" for people to reduce water usage immediately, as the utility struggles with debris, silt and mud in the water supply after historic flooding in the Highland Lakes. Lake Travis is the source of Austin's drinking water. "Austin Water is experiencing reduced water treatment capacity," the utility said in an email. "It is taking more time to remove the higher levels of silt and debris." The level of cloudiness in the lake water has increased by more than 100 times, according to Austin Water. The water utility for the City of Austin is hosting two meetings today – one in the morning and one this afternoon – to look at how Austinites pay for water. The meetings are part of a process called a cost of service rate study that could determine how water rates are calculated in coming years. Lake Travis, now 146 percent full, is being closely watched by officials deciding whether to open more floodgates on Mansfield Dam. If Lake Travis is forecast to rise to 710 feet, the Lower Colorado River Authority would have to consider increasing the flow of water downstream, raising the risk of flooding including along the shores of Lady Bird Lake in Austin. Travis County Judge Sarah Eckhardt issued a local disaster declaration Thursday after flooding damaged properties along Highland Lakes. Update: The LCRA now says it will not open eight floodgates on Thursday, Oct. 18, but may in the coming days. It’s never happened before, but the Lower Colorado River Authority will likely open eight floodgates on the Mansfield Dam above Lake Austin by noon Thursday. So, what can you expect if you live in Austin?